I make stained glass windows and mirrors, using lead came, instead of copper foil. My glass panels include kiln-formed "tiles" that I make by fusing, and incorporate into the panels along with other pieces of glass. My work is done in many sizes, shapes, and styles, such as Victorian, Arts-and-Crafts (Prairie Style), Contemporary, and Art Deco. My glass includes many colors and textures, some of which are silver-plated and/or iridized. I also use dense opalescent, transparent cathedrals, and textures such as traditional glue chip glass. I make my own frames of oak wood, rounded copper, and anodized aluminum. The wooden frames are generally of oak wood, and fashioned using traditional methods of fine woodworking, along with innovative techniques that optimize the characteristics of the material. 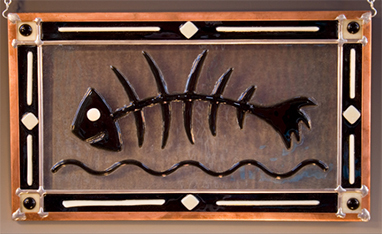 In addition to the framed stained glass panels, I also do kiln-formed glass work that includes casting, slumping, and fusing.